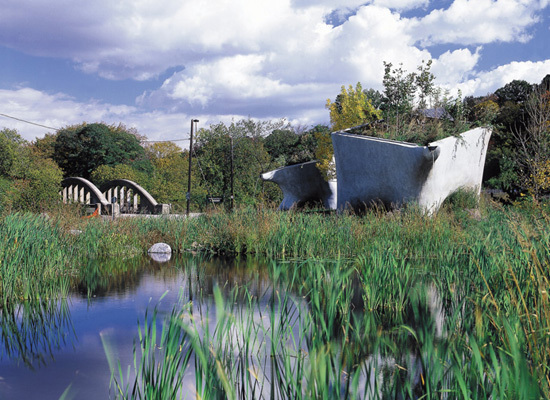 Continuing an occasional series on our formative design influences, this is Elevated Wetlands, a public art project in Toronto, Canada, by landLAB's principal landscape architect Neil Hadley and artist Noel Harding. Long time readers no doubt have noticed our obsession with constructed wetlands. This is the root cause, the epidemiological vector. 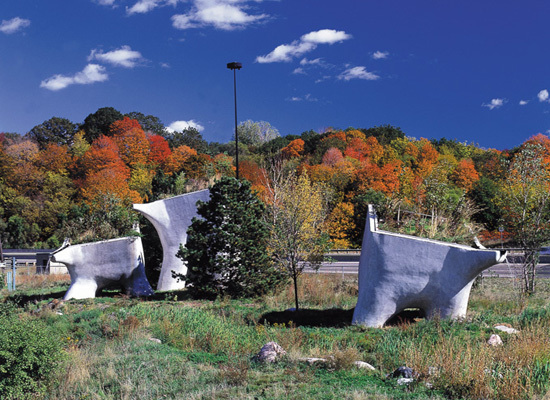 Installed more than a decade ago, the project consists of six large polystyrene containers that are filled with recycled plastics acting as large hydroponics planters for native plantings from the Don River Valley. 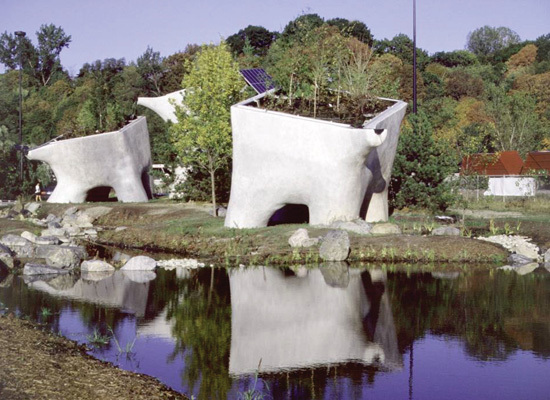 Water from the polluted Don River is pumped via solar photovoltaic pumps into the sculpture, and is filtered through the planted containers, and then cascades into large ground level wetlands, returning to the river cleansed. While the water that re-enters the river is significantly purified, the impact of these elevated wetlands in improving environmental quality is negligible at best. The water they process is too small. However, as a teaching tool on ecological and design issues, their impact may be far greater. In our case, it was profound. Elevated Wetlands taught us the remediating properties of wetlands and that these natural processes can be artificially recreated. Wetlands are the kidneys of the environment, we learned with further investigation, and like in some eco-utopian fantasia, these organs can be cloned without bodies — a modular cyborg landscape. Prominently sited as they are next to a major traffic artery into downtown Toronto, it was one of our very first lessons in context, something drilled into us during the heady days of Year One and forever after. And it was also an early introduction to the concepts of “revelatory landscapes” (i.e., making the invisible visible) and “working landscapes” (as opposed to landscapes of leisure and meditation). And this project even taught us that there needn't be a conflict between ecology and aesthetics, that in trying to reclaim degraded landscapes, the science and the technology that do all the heavy lifting can be incorporated into a work of art that isn't superficial but one that can actually be provocative. Now, a decade later, or post-High Line, how about finding disused elevated train tracks and converting them into linear wetland to treat urban stormwater and wastewater? A ribbony infrastructure coiling and recoiling around the city, spiraling around tower blocks and zigzagging down skyscrapers; an eco-progeny of Brutalist skyways, skybridges and skywalks. Hmmm. Thought I corrected that. I distinctly remember noticing that mistake and editing it. Now changed, in any case. Another great post. I love the concept of visualizing natural environmental systems. Although you are right in that they aren't necessarily accomplishing very much, the idea that the are educating the public is incredibly valuable. 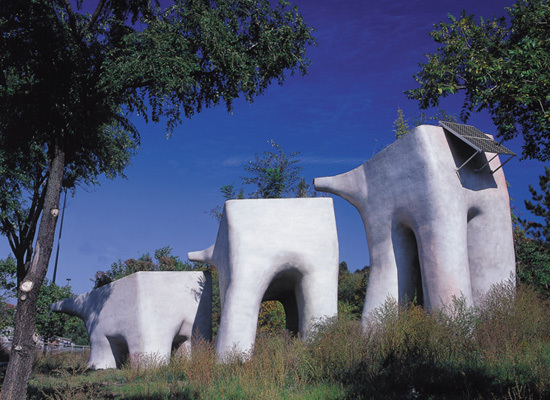 In this case I also am drawn to the playful forms...it almost looks like a family of giant gray elephants marching through the park. It would be really something if this artist/design team got some of these going in urban parks or plazas downtown. I think it would be a great addition to Toronto and really get more people to notice and think about the benefits of wetlands and water purification. I am glad to see the Typhoid Mary of your interest in constructed wetlands. I trespassed on the Highline years ago, and noticed pooling water, and when I found out later that they were planning on making a park, I thought they should include swampy areas. The Elevated Wetlands are a (urban) legend to Torontonians, or at least those with their eyes open. Here's the question: Do they operate today? And if not, what will it take to make them run again?